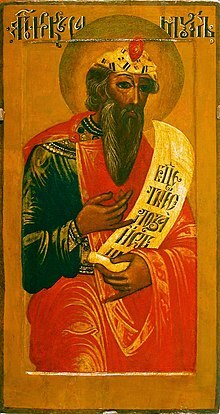 The icon o the prophet Samuel frae the collection o the Donetsk regional airt museum (Donetskij oblastnoj hudozhestvennyj muzej). XVII. Samuel (/ˈsæm.juː.əl/; Ebreu: שְׁמוּאֵל‬, Modren Shmu'el, Tiberian Šəmûʼēl; Greek: Σαμουήλ Samouēl; Laitin: Samvel; Arabic: صموئيل Ṣamoel; Strong's: Shemuwel), leeterally meanin "Name o God" in Hebrew, is a leader o auncient Israel in the Beuks o Samuel in the Ebreu Bible. ↑ 20 August: St. Samuel, Old Testament prophet | Fr. Z's Blog. Retrieved 2014-01-06. This page wis last eeditit on 14 October 2014, at 15:44.